Miriam’s honey-brown hair reached the small of her back and was magnificent in its soft unevenness, curling at the ends like a field of wildflowers. That is, until she turned three. Now it neatly skirts her shoulders; my little girl appears older, more self-assured. We cut her hair for the first time at her upsherin. Perched on a stool, her small hands folded in her lap, eyes wide, she smiled like a little Mona Lisa as our family and guests took turns ceremonially snipping strands of her long curls. This was not the first time my husband and I held an upsherin in our home. Miriam has two older sisters whose hair was also cut for the first time, among family and friends, when they were three. I tried to write an essay to describe the event we held for our eldest, and tried again after the second. Both times I was unable. I was too self-conscious. An upsherin, after all, is a ceremony for a boy. Not a girl. Unlike Shulie, who is an Orthodox Israeli, most of my friends have given their children their first haircuts perfunctorily; a few snips and it’s over. I’m saddled with the baggage of being a cultural anthropologist, though, and I can’t get away from the symbolism with which the event’s traditionally laden. I couldn’t help but see Rebecca’s untamed hair as a vestige of our earliest, most primordial connection: she came out of my body, into the world, with that hair! My difficulty cutting it manifested the most fundamental dilemma that mothers face: the desire to watch our children grow into functioning, confident, capable individuals…and our longing for them to stay close, connected. While Rebecca’s hair grew long and unruly, I often joked about holding an upsherin for her, though I knew it didn’t make traditional sense. The ritual is not only about “shearing” (a word with the same etymological root as the Yiddish “upsherin”), but is simultaneously linked to creating peyot — sidelocks. At a traditional upsherin, the three-year-old boy also dons a kippah and a fringed ritual undergarment (tzitzit) for the first time. Anyone who has witnessed an upsherin knows that the transformation is breathtaking. Like a caterpillar suddenly emerging from its cocoon as a butterfly, in an instant the child morphs from genderless baby into religious Jewish boy. I could not possibly conjure up a parallel ritual for my daughter! Still, Abraham held an event to mark the weaning of his son Isaac. Where was Sarah during this party? I wondered. And what about me and my daughter? As I moved from being the mother of a breast-feeding baby who wore diapers to being the mother of a child who could now attend to her own bodily functions, I longed for a ritual to usher me through our separation. I also realized that it was not only Shulie whom I envied; it was Rafi, too. In Israel, the upsherin ritual is generally called halaka, from the Arabic word for haircut. Although its origins are murky, anthropologist Yoram Bilu believes that the ritual may have been modeled on the Muslim custom of shaving children’s hair at saints’ tombs, and that this custom was practiced by Musta’arbim (Jews native to Palestine) as early as the Middle Ages. Anthropologist Harvey Goldberg suggests that the custom first emerged among North African Jews who cut their sons’ hair for the first time at the age of three near the graves of local venerated rabbis. About two centuries ago, it seems, the halaka became intertwined with another ritual that had evolved in a different part of the Jewish world. As far back as the 12th century, Western European Jews held a “school-initiation ceremony” when boys started their religious study. Historian Ivan Marcus explains that a father would wrap his child in a prayer shawl and take him to the home of the local teacher. Seated on the teacher’s lap, the boy would recite a Hebrew alphabet that had been written on a tablet and smeared with honey. The boy would lick off the honey. Today, among the ultra-Orthodox — and expanding to other observant circles — these strands are woven together. The child’s upsherin is combined with his introduction to Jewish literacy. Indeed, his recitation of the alef-bet is the linchpin of the ritual. Through his newfound ability to discern letters, he is welcomed into the vast world of Jewish textual knowledge, linked into the chain of transmission. When he was a newborn, this same boy was welcomed into the community through his milah (ritual circumcision), which left him with an indelible physical mark binding him to Jewish history. Yet he carries no memory of this. By contrast, he is an active, conscious participant at his upsherin. The ritual is meant to imprint upon him, at a key developmental moment, his place in history, his connection to a community past. I loved this powerful gift that Rafi’s parents could give him so easily, since he was male. Yet as a woman, and as a mother of girls, I was also troubled by it. The ritual, as it is widely practiced today, fuses together separate maturational events: the child’s transformation out of babyhood is linked to his gendering (he goes into the ritual looking genderless or girl-like, and finishes the ritual as a boy), and his gendering, in turn, is linked to his induction into literacy. If the upsherin sends the message that “growing up” means “becoming a boy” and gaining access to literacy, where does this leave our daughters? Personally, it left me confused. I recoiled from the upsherin’s display of male propriety over Jewish textual tradition, a tradition to which girls and women were for so long given little or no access. Still, I was drawn to its richly layered lessons about what it means to belong, to be Jewish, to grow up. So I pulled apart the strands, un-fusing the three events, opening them up in a way that made it possible for me to give my daughters upsherins, too. The process was not totally comfortable or smooth, taking me three times to figure out. Well, now my dear Miriam is three, and I am 45. I have most likely said goodbye for the last time to a fully dependent baby and also to a rich, blessed stage of my own life. We held Miriam’s upsherin on the eve of Shavuot, the holiday that commemorates the receiving of the Torah. How auspicious! My husband Moshe and I invited a few friends — some because they had watched Miriam grow, some because we knew they were kindred spirits who would appreciate what we were trying to do. After the ceremony [below], we had a festive meal, and I felt happy and sad. I said goodbye to my last baby, trusting that Moshe and I have launched her on the road to becoming a rooted and learned Jewish woman. May Rebecca, Anna Belle and Miriam study our Jewish texts. May they celebrate our holidays and stay close to our People. May they remember who they are and from whence they came. Alanna E. Cooper, cultural anthropologist and adult educator, is Director of Jewish Studies at Case Western Reserve University’s Siegal Lifelong Learning Program. She became interested in women’s haircutting rituals while conducting field research in Central Asia, and has written about them in her book, Bukharan Jews and the Dynamics of Global Judaism. 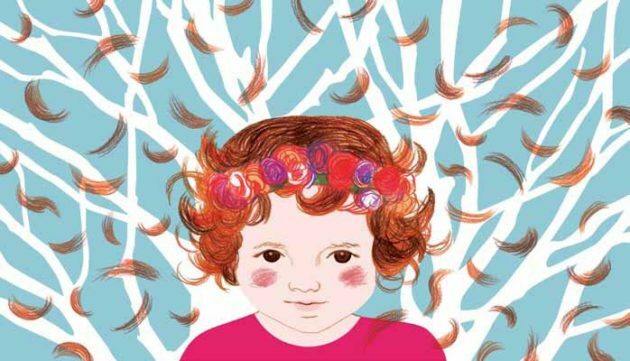 So beautifully written, I’ve got a four year old daughter with long gorgeous hair, and this made me really think about whether I’m ready for her to get it cut. And if not, why?